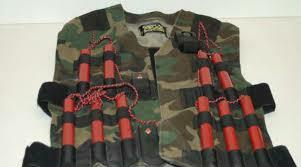 2 suicide bombers blow self up in failed Maiduguri Mosque attack - BlogIT with OLIVIA!!! Two suspected Boko Haram suicide bombers blew themselves up near Sulemanti Mosque in Maiduguri metropolis, Borno State, in the early hours of yesterday. The suspects, according to Borno State Police Command, strapped with Improvised Explosive Devices, IEDs, targeted a mosque in Sulemanti. However, the bombs went off, killing the two suspects during midnight Ramadan prayers. A civilian Joint Task Force member, Bukar Fantami, said the suicide bombers were intercepted near a mosque premises, where they blew themselves up. Fantami said: “The people in the mosque took to their heels, while we challenged the explosives-strapped suspects on their mission to the mosque, before the explosives exploded near the mosque, under this tree. Meanwhile, the mosque has been condoned off by soldiers and policemen to prevent any further attacks on mosques and other public places in the metropolis.